Power Tools DIY Power Tools Router 1/2" 1500W Electronic variable speed, soft start, adjustable plunge depth, parallel and circle guide. Lock-off button, spindle lock and spanner. Includes 1/2”, 1/4” and 8mm and 12mm collets. Base diameter 170mm. No load speed 6000-26000rpm. Power Tools DIY Power Tools Router 1/2" 1500W Electronic variable speed, soft start, adjustable plunge depth, parallel and circle guide. Lock-off button, spindle lock and spanner. Includes 1/2”, 1/4” and 8mm and 12mm collets. Base diameter 170mm. No load speed 6000-26000rpm.. Record Power Profiled Leather Honing Wheel 100mm. Powerplus 1020 Watt, 240v Variable Speed Router with Parallel Guide and 12 Piece x 8mm Router Bit Set in Handy Carry Case Kit POW162X - 2 Year Home User Warranty. Power Tool Accessories Router Cutters Dovetail Cutter 16mm x 22mm 7° To produce dovetail joints.. TK9K® - Power Tool Accessories Router Cutters Biscuit Cutter No.10 & 20 1/2" Sharp TCT cutting edges. Interchangeable bearings convert from No.10 to No.20 biscuit.. Record Power Fingernail Gouge Sharpening Jig. Record Power RP2000 ¾" 16tpi Woodturning Scroll Chuck. 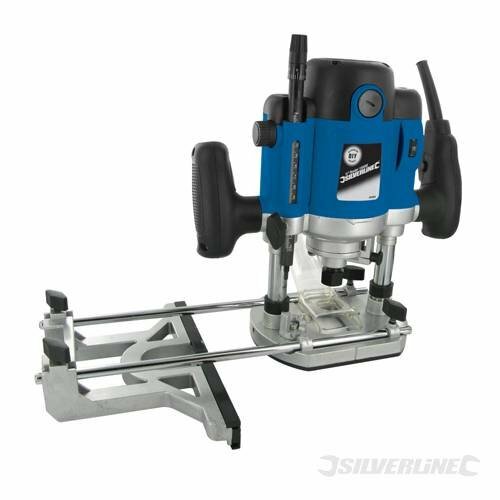 Wolf 1200w Variable Speed Plunge Router Power Tool - Supplied with 6mm, 8mm and 1/4” Collets. Water & Wood 2pcs 2mm Dia Shaft 300 Low Speed Solar Power Motor DC 3V 5000RPM. Lumberjack PR12 Powerful 1800w 1/2" Router With Variable Speed. Record Power Long Blade Sharpening Jig. Advanced Ryobi Power Tools ERT-1400RV Router 1/4 in --. Power Tool Accessories Router Cutters Dovetail Cutter 16mm x 22mm 7° To produce dovetail joints. Power Tool Accessories Router Cutters Straight Imperial Cutter 1/8" x 1/2" Straight cutter with sharp, durable tungsten carbide blade. Power Tool Accessories Router Cutters Biscuit Cutter No.10 & 20 1/4" Sharp TCT cutting edges. Interchangeable bearings convert from No.10 to No.20 biscuit.